Ever since abysmal payrolls number hit the wires, gold has performed exceedingly well. Additionally, it does seem as if there is some strong gold buying ahead of the upcoming “Brexit” vote, an event which has the potential to create a fair amount of chaos depending on which way it goes. 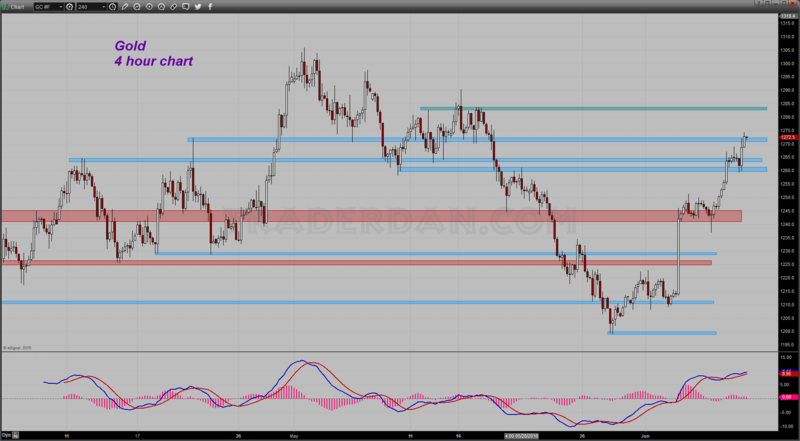 Yesterday we noted the region near $1265 as providing overhead resistance. That went “bye-bye” today as the metal easily surged through it and on to the next resistance barrier near $1272. If it can dance above this level for a while, it looks as if it is going to test the $1282-$1285 level. Downside support should be seen first near $1265-$1262 and then back at $1250. 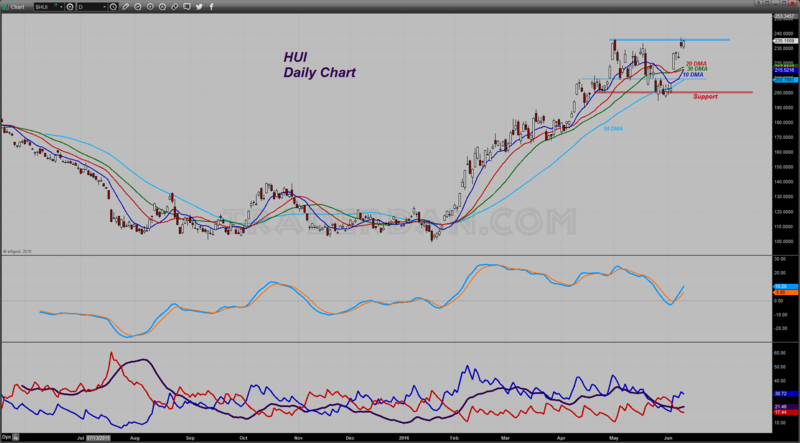 With the mining shares so strong, setbacks in price should be well supported. Speaking of the mining shares, apparently Mr. Soros, a leftist who has a vile habit of undermining anything that remotely resembles individual liberty, is enamored with gold stocks and that has the investing world piggybacking his ownership of the shares. The chart is strong but recent price moves higher have yet to put in a CLOSE above the early May peak. We will be watching to see if that can be done. Note that all of the major moving averages shown are trending upwards and that price remains well above them all. That is strongly bullish. I should also note that this is becoming a crowded trade. This does not mean that it is going to reverse; what it does mean is that as long as the sentiment towards higher rates remains in place, the trade will become even more crowded. In this yield-starved environment, investors are DESPERATE for yield and anything that they can drive higher, they will. That is all fine and dandy until it isn’t. Just do not get too complacent about your positions and start overestimating your investing genius. You cannot take anything for granted in these goofy markets. Personally, I would feel a whole lot better about things if I could see solid evidence of copper prices rising higher. The fact that the red metal continues to languish makes me nervous. Deflation fears are not going anywhere as long as that metal does not rally. 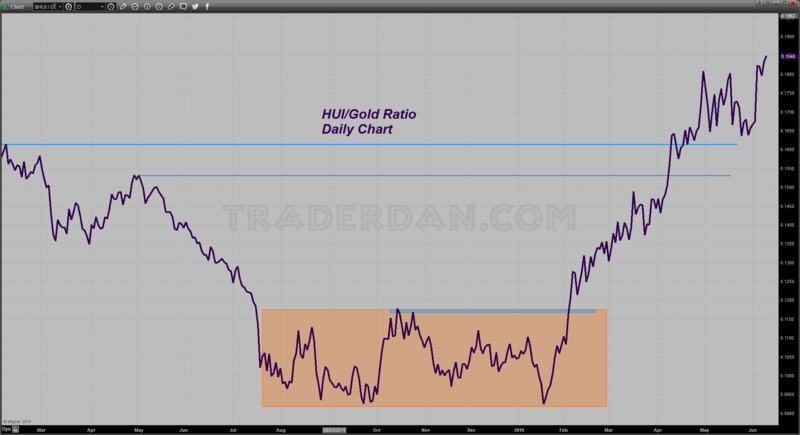 By the way, here is an updated chart of the HUI/Gold ratio. It is very, very strong. Silver seems to be following gold more of late than it is the rest of the industrialized metals. That means for now it believes it is a precious metal instead. It is sort of like Peter Pan – it can fly only as long as it believes it can fly. I wonder what might happen to silver if copper and/or the rest of the base metals were to start breaking down in the event of worsening economic news, especially out of China. The grey metal is running higher in a strong way but as you can see from the chart, there has not been much in the way of overhead resistance zones on the charts beyond that $16.75 zone. It is now pushing towards a region that should bring in some selling. That starts near $17.35 and extends to just beyond $17.50. I would like to see the metal actually CLOSE UP there as it had only one close above $17.50 in more than a month. That would tell me that the bulls have a real shot at making a run to the May high above $18.00. 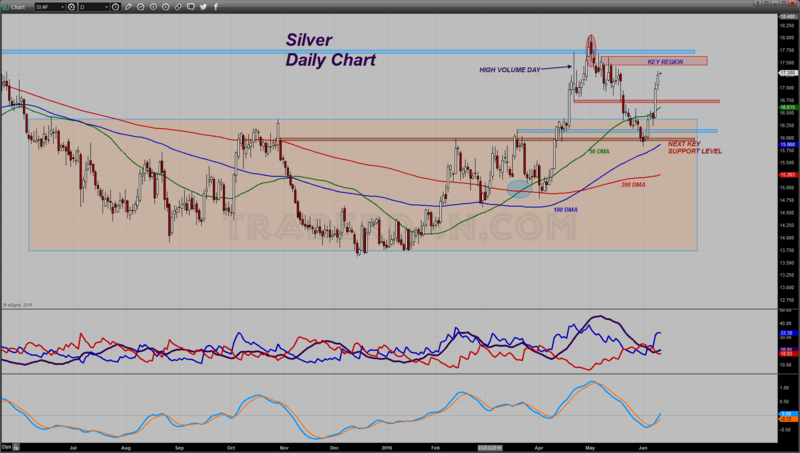 The fact that silver was able to perform so well today, in spite of the strong US Dollar, was telling. That plus the fact already mentioned completely ignores the weakness in copper and some of the other industrial metals.